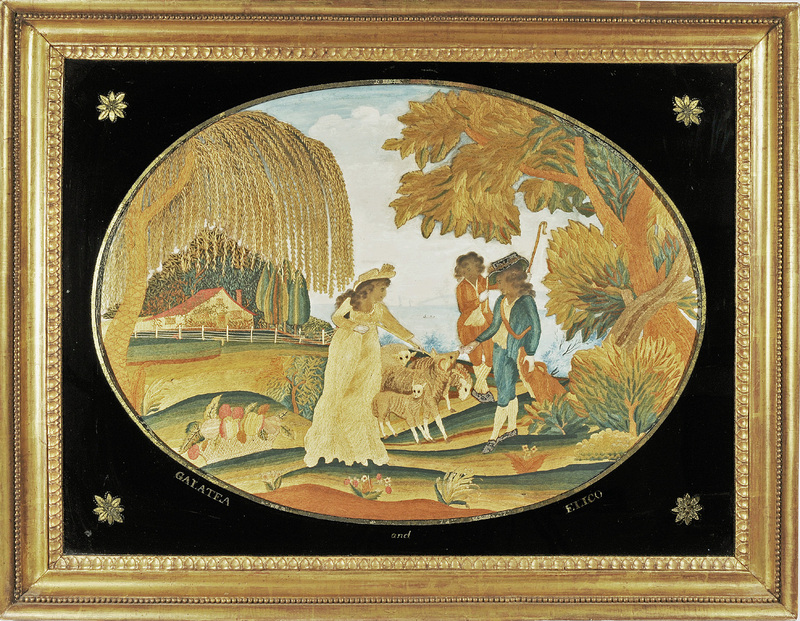 STEPHEN & CAROL HUBER, Old Saybrook, Conn. Hubers@AntiqueSamplers.com 860-388-6809 The pastoral romance novel Galatea is the subject of this anonymous needlework picture worked at the Folwell School. As the heroine of the novel by Miguel de Cevantes Saavedra (1547-1616), also the author of Don Quixote, she has captured the hearts of all the shepherds. The book, written in 1585, was translated from Spanish into French by M. Le Chavalier de Florian and later into English, and became a very popular novel with young ladies studying literature in the early Nineteenth Century. The scene in this needlework depicts Elico, who is madly in love with Galatea, offering food to one of her sheep while she tries to intervene. The print, by Charles Knight, London, 1788, on which this composition is based bears the quote, “Why punish your Sheep, when it is me you wish to chastise?” The piece is silk and watercolor on linen measuring 23 by 29½ inches framed, circa 1810, Philadelphia.